The Bureau requires manufacturers to make upholstered furniture and bedding products sold in California flame-retardant. In the event of a residential fire, these products act as a significant fuel source and are difficult to extinguish once ignited. The Bureau measures flame retardance in accordance with flammability standards developed by the Bureau or the United States, Consumer Products Safety Commission (CPSC). 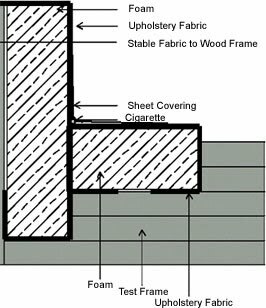 Since 1975, the Bureau has developed several flammability standards, called technical bulletins. These performance-based standards do not prescribe the use of flame-retardant chemicals, manufacturing methods, or specific materials to meet the standards. The Bureau encourages the industry to use innovative solutions and products to achieve flame resistance without compromising the environment. Manufacturers must strictly adhere to state and federal laws governing the manufacture and sale of upholstered furniture and bedding products. 1. All specimens shall be tested, and conditioned for a minimum of 24 hours, at 70 ± 5°F and less than 55% relative humidity. 2. The specimen in its holder shall be suspended vertically in the cabinet in such a manner that the lower end of the specimen is 0.75 inches above the top of the burner. 3. The burner flame shall be adjusted by means of a needle valve in the base of the burner to give a flame height of 1.5 inches with air supply to the burner permanently shut off. 4. After inserting the specimen, the burner flame shall be applied vertically at the middle of the lower edge of the specimens for 12 seconds. 5. The cabinet door shall remain shut during testing. 1. The average char length of all specimens shall not exceed 6 inches. 2.The maximum char length of any individual specimen shall not exceed 8 inches. 3.The average afterflame, including afterflame of molten material or other fragments dropping from specimens, shall not exceed 5 seconds. 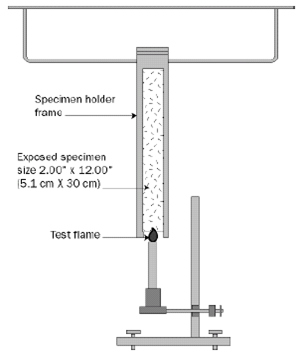 4.The maximum afterflame of any individual specimen, including afterflame of molten material or other fragments dropping from the specimen, shall not exceed 10 seconds. 5. The average afterglow, including afterglow of molten material or other fragments dropping from the specimen, shall not exceed 15 seconds. 6.Resilient cellular materials shall meet the above requirements both before and after aging for 24 hours in a forced air circulating oven at 220°F (104°C). 7.A minimum of 10 test specimens shall be tested; 5 specimens before aging and 5 specimens after aging. 8. Test requirements for resilient cellular materials shall be evaluated according to the following sampling procedure both before and after aging. 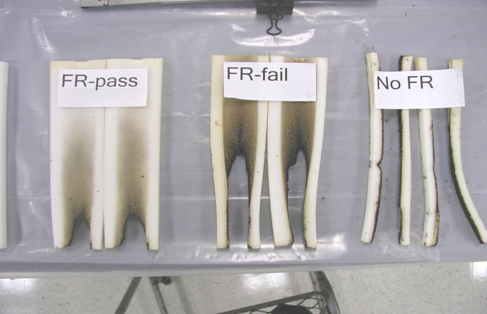 evaluates the foam assessing the non-smoldered residue which shall remain superior to 80 % of the entire test specimen mass.